Since we grew up in Southern California, we traveled to Mexico often as kids. And at home, we are exposed to Mexican food, people, and culture daily. So its safe to say that we know good, authentic Mexican food. And we love it too. This past summer in Europe, we were craving Mexican food! Tacos, sopes, chilaquiles, chips and guacamole, the whole enchilada! We didn’t think we’d easily find any real Mexican food over in Europe. But we were SO wrong. To our surprise and delight, we found many Mexican restaurants in Barcelona and Madrid, but of course, some were more authentic (and all around better) than others. With the help of Yelp, we found the crown jewel of Mexican cuisine in all of Europe: Tlaxcal. Though Tlaxcal is a little on the expensive side, we felt no remorse in spending our hard-earned cash there. At Tlaxcal, Mauricio and I usually order an appetizer, three plates of tacos, and two margaritas, and it all totals to about $60. If the budget for your Barcelona trip is tight, splurge on Tlaxcal, and you’ll leave full and happy, and before you even leave, you’ll probably make a reservation to come back the next day. So maybe this isn’t such great advice for budget travelers, but hey, it’s authentic Mexican food, friendly and fast service, and a fun atmosphere. We even found out that the owner of Tlaxcal, and many of the employees, are actually from Mexico originally, so they know what they’re doing in the kitchen. I promise, Tlaxcal is worth the money! 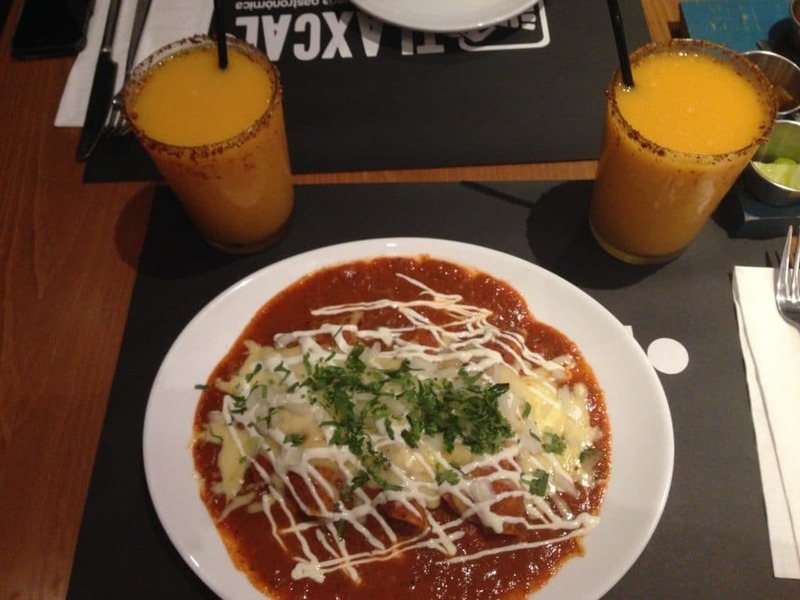 But now let’s actually talk about the food and drinks… We highly recommend the mango margaritas! First of all, the rims are coated in chile salt, which creates the perfect combo of spicy and sweet. The margaritas also have a great blend and thickness, and will go great with whatever you choose on the menu. However, if margaritas aren’t your thing, then the next best thing to order would be a Coronita, which is, in our opinion, one of Mexico’s best beers. Then, when it comes time to choose what to eat, it’s a bit of a problem. Actually, I’ll rephrase and say that it’s a huge problem. There are too many things on the menu that sound way too good. For me, it was a huge chore to choose just one or two items. Why can’t I just have them all?… And preferably twice a week, at least. As you can tell, I’m crazy about this place. Luckily, we were in Barcelona for a few weeks, and we had time to return to Tlaxcal four or five different times. But I digress. We always order the chilaquiles de pollo con salsa roja (chicken chilaquiles with red salsa) for our appetizer. These things are pretty much to die for; they’re super spicy, crunchy, and fresh. We also tried the enchiladas as an appetizer, and they were by no means terrible, but the chilaquiles definitely triumph. In regards to the entrees, we experimented a lot, and we found which dishes are the best. 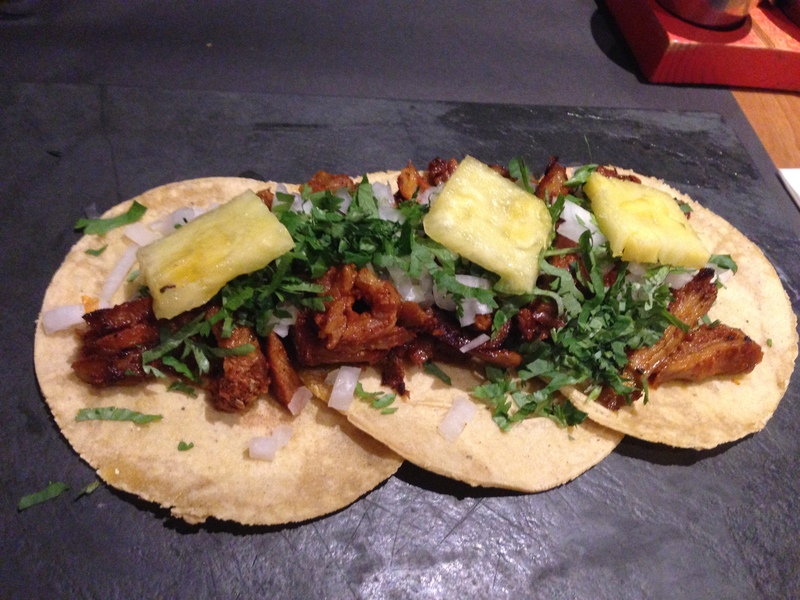 Do not miss the tacos al pastor; they are as authentic as can be, with perfectly cooked al pastor meat, garnished with fresh pineapple, white onion, and cilantro. Al pastor tacos don’t get any better than Tlaxcal’s, folks! Mauricio is also a big fan of Tlaxcal’s tacos alambres con pollo, which have chicken, bacon, green and red peppers, and onions, all melted together with cheese. YUM. The cochinita pibil tacos are also an excellent choice. Everything at Tlaxcal is good, and everything at Tlaxcal is served with their signature salsas, which range in heat and flavor. They are fresh and delicious, and top off every dish on the menu perfectly, plus a couple squeezes of some fresh lime juice. If we could give you any sort of travel tip or inside information on Barcelona travel, we wouldn’t think twice about saying that Tlaxcal is the no-brainer, absolute best restaurant in the city. Don’t miss it. After writing all this, I really wish Mauricio and I were back in Barcelona, at Tlaxcal, eating the best tacos and chilaquiles on the planet! Sigh. Have you ever been to Tlaxcal in Barcelona? Do you think there is somewhere better to get Mexican food in Spain? Let us know in the comments! We’d love to hear from you!